Exclusive Interview with Southland’s Shawn Hatosy! If you can believe it (I hardly can), Southland is back tonight at 10/9c with a brand-new season. With last season’s big moment still spinning around in my head, I can hardly wait to see what happens next. As a little teaser, I was able to talk to Southland star Shawn Hatosy, who plays Sammy on the show. He tells us a little about what we can expect from his precarious partnership with Ben, his crazy ex Tammi, and what keeps Sammy going. First of all, I am in a weird state of both disbelief and absolute excitement that we’re already starting the fifth season. It feels like this show just ended and now its back and I’m just so excited. Well, thank you. I’m excited, too. Anything you can tease us about the coming season? Well, you can see in the first two episodes…I know that they sent out some kind of screener. Were you able to see any of it? Yeah, I saw the first episode. Oh cool. Well, so you know, that season five Southland, Ben and Sammy are still riding in the car together. Michael’s character, John Cooper, is… his partner from last season has left, and he’s riding with a new boot who is an Iraqi [War] veteran, at least for the first two episodes, that’s what’s going on with him. And then Lydia is still riding with Reuben. Last season, Sammy and Ben had a situation that created a ton of tension and conflict in their relationship where Ben went after this pimp off-duty, and the pimp ended up getting killed. I think Sammy is still questioning if the protocol that Ben used was the right one… There’s a ton of tension still in the car with these guys and here we are. It’s season five, and we’ll kick it off. It’s very clear in the season opener that the partnership we see between Ben and Sammy since last season at the beginning is completely different than what we see at the beginning of this season. How is that going to play out over the course of the season? The contrast is really great. I was also very excited to see that Tammi’s back in the picture. She always adds a great point of drama for Sammy. I’m curious to know what’s going to happen with that? What can we expect? Is there going to be craziness? What can we look forward to? There is some craziness, and I enjoy that aspect of the story. It’s always been one of the things that attracted me to Southland in the first place… That we get to see these guys when they go home and what their lives are like, because let’s be honest, that’s how characters develop. It’s not just about solving crime. So, I think that Tammi and Sammy have had a history, a very dysfunctional relationship, but they did decide to have a kid together… but they’re no longer together, and as Sammy and everybody else in Los Angeles knows, Tammi is a little bit unstable and irrational. So now she’s with the kid, and I think that Sammy feels a lot of guilt and responsibility. He’s very worried about his son being with Tammy so as the season progresses there is the threat that he may lose to her in custody battle. Sammy’s always been very good about compartmentalizing work and his personal life, but it starts to really bleed into the work and it goes so far…that his career becomes slightly in jeopardy. You mentioned this earlier, and I’d love for you to expand on it. You’re exactly right; Sammy’s one of the most decent, caring characters on the show. What do you think keeps him going? I just think that he has this center… From the pilot you can see that when it came to these kids who were gangsters in this really dark world and not being able to come forward and talk about what they’ve seen. To me, it breaks my heart as the actor and that was actually what I connected to in the pilot. I always go back to that when I decide what his motives are and what his point of view is. He always looks through things with that lens. Are there any other projects that you’re working on that you wanted to talk about for us to keep an eye out for? For me right now it’s just this. I’m very proud of the show. I’m glad it’s still on, and I’m glad that TNT has given us a season five. The four main actors and Christopher Chulack, our executive producer and director, we love doing this. It’s a lot of fun. I appreciate it. I can’t imagine being more satisfied than I am on Southland. As a viewer, I’m loving every minute, so thank you so much. Don’t forget to catch Shawn Hatosy tonight when Southland returns at 10/9c on TNT! Is anyone else ready to escape the heat? Well, why not just escape? That’s the challenge for three teams on the new TNT reality competition show, The Great Escape, which premieres this Sunday at 10/9c. The show drops three teams of two in a secret location. Then, they have to race their way out, facing challenges along the way. Oh, and the occasional guard, who will take you back to the start if they catch you. The winner gets the honor of having broken out of some of the world’s toughest places — and $100,000. I had the pleasure of talking with the show’s host, Rich Eisen of NFL Network fame. He’s taking full advantage of the football break and taking us along for the contest of a lifetime that takes viewers and contestants alike through mysterious locals like Alcatraz, an insane asylum, and the USS Hornet. Check out our chat below, and don’t forget to check out the show this Sunday! So I have to ask, how did you get involved with The Great Escape? It seems very — outside of what you’re really known for, especially with the NFL Network. Well, one of the executive producers and co-creators of the show, Charlie Ebersol, I’ve known for a long time, and he came to me over a year ago saying, I want to show you something. Let’s meet. So we met, and he showed me on his iphone this incredible sizzle reel for The Great Escape that was fronted by Ron Howard. And he told me who was involved — Ron Howard and Brian Grazer’s Imagine Entertainment, Bertram van Munster, and Elise Doganieri, the creators and producers and showrunners of The Amazing Race. And they had never done a second reality show before, so this was their first bite into doing it a second time. And TNT was the network that was interested in piloting this and putting it on television if it worked out. And I’ve known Michael Wright from TNT for several years. And I was blown away. And the funny thing is, anybody who — I assume you’ve seen — have you seen an episode of this? I have. I’ve seen the first episode. Yeah, I mean anybody who’s seen it is sort-of blown away by it. And even just the three-minute reel of me seeing what they had in mind, blew me away. And so I was interested from Jump Street. It all came together. And part of it, too, was, you know, they’re shooting in what we call the non-playing season of the NFL, and it’s airing mostly outside of the NFL season on Sundays, which I’m used to be on television, I guess, so it sort-of all worked perfect. Great. And I’m kind-of curious, as far as — you talked about the sizzle reel. What particularly stood out to you that makes it unique. I mean, I’ve seen the first episode. I was completely enthralled the entire time. I’m curious what grabbed you. Well, what grabbed me was just the sheer — the hugeness of the production. It’s grandiose. And the way it was pitched to me and the way it has been produced and the way it will be broadcast — it is huge. It’s like a summer blockbuster, popcorn-type event! The thing that I really like about it, too, is it stars real people. These are real folks, you know, mother/daughter teams, father/daughter teams, brother/sister teams, best friend teams, the “platonic” friend teams. I mean, these are real folks, and when they win the money in the end, have real life issues that are aided in winning this money. And it’s all being run in a real location. And that’s the thing that I loved about it. They’re like, we’re going to go to some really crazy places that exist and turn it into our movie set starring real people. And I’m like, ok! That sounds great! And I’ve watched it now executed eight times; we’ve got two more of the ten episodes to be shot, and I can’t wait to do them. Tonight’s the night. If you’ve been wondering whatever happened to J.R., Sue Ellen, and Bobby, tonight you get to find out. And if you’re wondering whatever happen to those kids and what men they grew up to be, well, get ready to see the Christopher and John Ross for who they really are now. It’s been 20 years, and it’s time to see what the Ewings are up to. But first, how about a quick chat with the stars? I was thrilled to be part of a conference call with Patrick Duffy and Jesse Metcalfe, who play Bobby and Christopher respectively. Check out some of the Q&A below, just in time for tonight. And don’t forget. The two-hour premiere event of Dallas airs tonight at 9/8c on TNT! Jesse Metcalfe: Okay. Well, I’d say it’s a more contemporary version of the original show. You know, I don’t think we’ve changed what made the original series great. I mean, the show still centers around these major themes of, you know, family dynamics, and greed, and loyalty, and love, and betrayal. But we’ve just updated it. And we made it modern and definitely socially relevant to the times. And in addition to that, you know, we added some new characters. Obviously, Christopher and John Ross were established in the original series. But, you know, you now get to see the type of man that these two children have grown up to be. Patrick Duffy: The Ewing housekeeper for, you know. Jesse Metcalfe: Yeah, the Ewing housekeeper. And, you know, she definitely wasn’t a part of the original series. And then we also have my fiancé, Rebecca Sutter played by Julie Gonzalo so. It’s a great marriage of the original show and the original cast and some new cast members. Patrick Duffy: Yeah. The difference also is just technologically speaking television is done so differently now that if we tried to duplicate the old school Dallas, I think it would be slow in appearance and in substance for a modern audience. So with the technology that we have with high def cameras and the new way of directing television, which is so dynamic and so intense in terms of the pacing. And the scripts reflect that also. They’re much more condensed. We get maybe four or five episodes of an old Dallas in one episode of the new Dallas. So all of these things, I think, contemporize the old show. But we maintain the honor that Cynthia Cidre and Mike Robin feel towards the show. So that hasn’t changed. And I think that’s what will impress old viewers as they look at the new Dallas is it’s so much similar to what they were used to. But it’s done for a contemporary audience. So we think we got the best of both worlds. And we’re hoping that everybody out there is going to agree with us. Are you ready? Because tomorrow it starts all over again. Of course, I’m talking about Dallas, which is premiering tomorrow in all its glory with a two-hour premiere event on TNT. The series had fourteen seasons, starting in the ’70s, and now we’re back again, revisiting the characters we loved and meeting some anew. I was fortunate enough to talk to two cast members of the series, Linda Gray and Josh Henderson, who play Sue Ellen and John Ross respectively. And boy were they fun to listen to. Both were super excited about the upcoming series, and if the quick interruption by Patrick Duffy and Larry Hagman were any indication, they’re having a lot of fun with it! So check out some highlights below from the conference call. And don’t forget to tune in tomorrow for the premiere! Linda Gray: It took a diamond and polished it. What can I say? It’s magic. It was magic in 1978, and it’s got a little 2012 fairy dust sprinkled on it. It’s just wonderful. Josh, did you know about this show at the time? Were you familiar with the older one? Josh Henderson: I was, yes. You know, I’m originally from Dallas, Texas. I was born there so, you now, my family — it was a very kind-of popular thing for my family. My memaw — my grandmother — Dallas was her favorite show, and she kind-of always said, being from Dallas, Texas, you go to church, and you watch Dallas. That’s kind-of what you do out there. So it was definitely something that I knew of. I was a little too young to remember actual details of the show, but I definitely knew of how big of a deal it was as a child. Hey, Boston! See Dallas First — Special Event with Jordana Brewster and Julie Gonzalo! Do you live in the Boston area? Do you want to see the first episode of TNT’s new show Dallas before anyone else? Do you want to see it with not one but TWO of its stars? Well, you’ve come to the right place. Here’s your opportunity. The AMC Boston Common Theater is hosting a special screening event on Wednesday, June 6, at 7:30 pm where you could see the first episode of Dallas. That’s a whole week before anyone else! Imagine what stories you can tell at the watercooler the next day! Plus, two of its stars — Jordana Brewster and Julie Gonzalo (aka, the two gorgeous ladies in the picture above) — will be there for a Q&A after the show. How about that? How do you get there? Well, it’s easy. First, RSVP to DallasBostonRSVP@gmail.com with your first name, last name, and number of people attending and be sure to put “Raked” in the subject line. Second, print out the ticket below (click the ticket for a larger image to print). Third, show up with your ticket — and show up early! Limited space available. Entry is first come, first serve, and a ticket does not guarantee admittance to this event. Then, get ready for a great show! Already anxious to find out more? Check out more on the show here! This is certainly a summer series I can’t wait to check out, and trust me, whether you loved the original or are a brand-new fan, it’s got something for everyone. So don’t miss your chance to see it now! 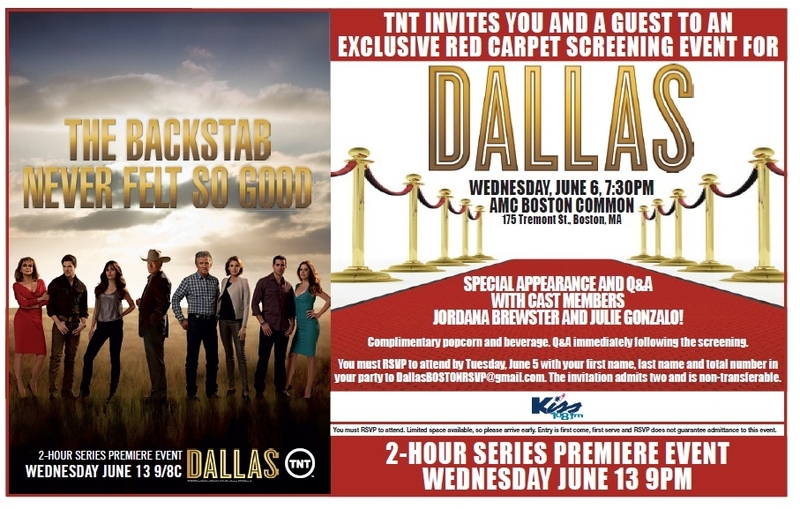 And even if you can’t attend, don’t forget to check out Dallas when it premieres on June 13 on TNT at 9 pm. Extremely good news for me today. TNT has renewed Southland. The best, most realistic cop drama on TV will be getting another ten episodes. I can’t wait. Southland finished its far too short fourth season last night. It was another very good season overall, the standout being Cooper and Tang’s partnership. Lucy Liu was a great addition, so I’ll be sad to see her go. Cooper and Tang didn’t leave on the best of terms; Cooper was angry at Tang for covering up her accidental shooting of a child a few weeks ago (in one of the episodes I missed, unfortunately) and for putting both of them at risk with her reckless actions in the car wash. In the end, Cooper’s back on the beat with a young rookie who looks even more green than Ben did a few seasons ago. Speaking of Ben, he’s come a long way since his idealistic beginnings. At the beginning of the episode, an injured Sammy implores Ben to not seek revenge for the attack that almost killed them both. Ferguson, his temporary partner, suggests the same. Ben promptly ignores the advice of both men and spends the episode tracking down the pimp who tried to kill him. He winds up chasing the man into and alley, and shooting him. We don’t see the actually shots fired, but when Ferguson catches up, we see a gun on the ground next to the suspect. The suspect’s gun, though, looks suspiciously like a gun we saw on Ben’s workbench at the beginning of the episode. Did he shoot an unarmed man, and plant the gun on the suspect to justify the killing? At the end of the episode, Sammy looks at Ben with a face full of concern and distress, and Ben just seems to look back with an empty expression. It seems to me like Ben has taken a dark turn, and I wonder if Sammy will wind up blaming himself for his partner’s seeming corruption. I found Lydia’s storyline this season to be a bit boring. Her cases just weren’t that dynamic, and I wasn’t quite as drawn in to the story of her pregnancy either. She ends the season by taking herself off the streets for the rest of her term. I’m hoping the writers can make things a little more interesting for her in the next season; I think it would be interesting to see her try to balance a new baby and her work as a detective. I don’t think renewal for a fifth season has been confirmed yet, but from what I’m hearing it seems likely. Let’s hope so, because this season just continued to prove that Southland is the best, most realistic cop show on TV. Next year, I’d really like to see the three major storylines intersect a little bit more, but I’ll take whatever I can get.